Enjoy the full range of your music. 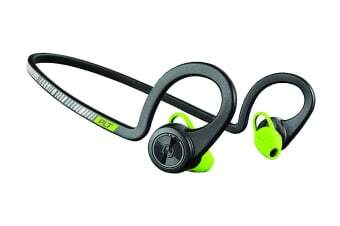 Train harder and run longer with the Plantronics BackBeat FIT. Enjoy flexible, durable and waterproof wireless sport headphones that withstand your most intense workouts. When it comes to your workout, nothing gets in your way. Stay focused and distraction-free with wireless sport headphones that stay comfortably in place. BackBeat FIT provides superior stability with a behind-the-ear design and comfortable eartip. The only reminder that you’re wearing them is the rich sound of your favourite playlist or podcast pushing you to your next personal best. Ready to go the extra mile or ten? Flexible and durable, BackBeat FIT pushes you further, withstanding the rain or a rinse under the tap with a waterproof design that meets the IP57 rating and an additional sweat proof nano-coating. And whether you wear them running road side or on the trail, the open eartip design lets you hear the sounds around you. With up to eight hours of listening from a single charge, BackBeat FIT helps you power through a full week of workouts. Subtle voice alerts let you know how much listening time you have left and the 15-minute quick-charge provides an hour of play to get you through the day’s challenge. Included with the BackBeat FIT headphones, the IPX5-rated water-resistant mesh charging pouch provides up to 16 additional hours of listening time, plus easy stowing and ventilation for sweaty headphones.